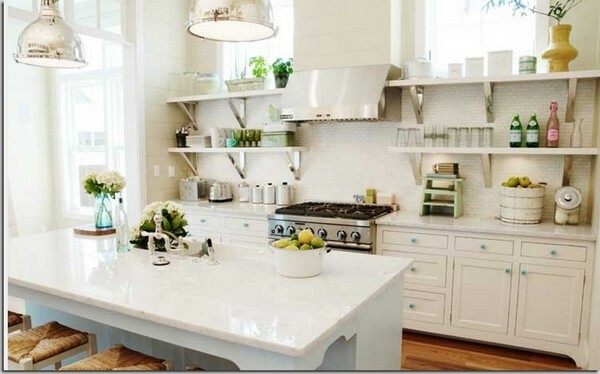 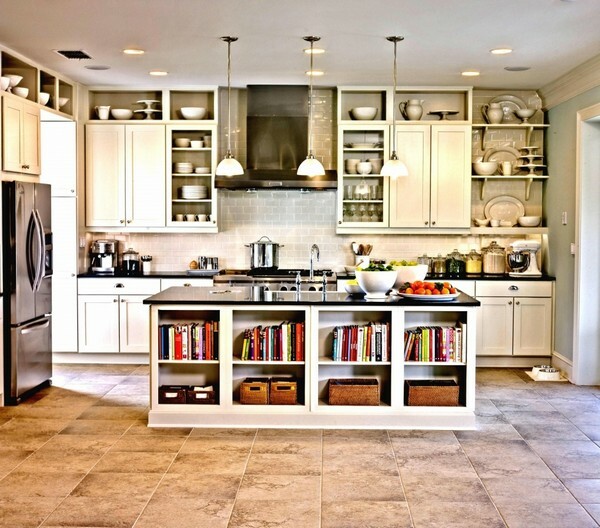 Many people have traditionally shied away from adopting open shelving ideas for their kitchen designs. 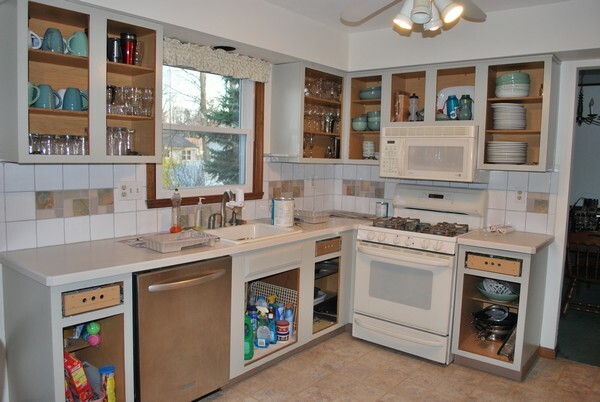 Instead, most people prefer canbinets for their kitchens. 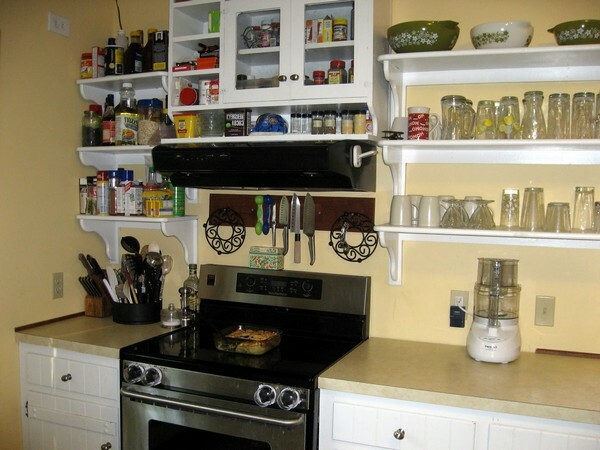 However, as you browse through this article, you will fall in love with the beauty of open shelving. 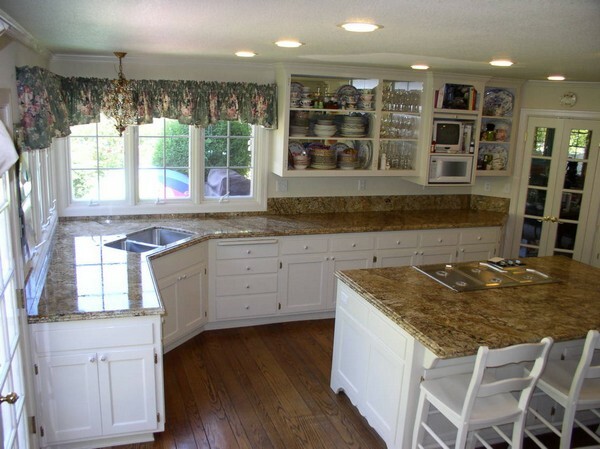 Here are some concepts you might put into use. 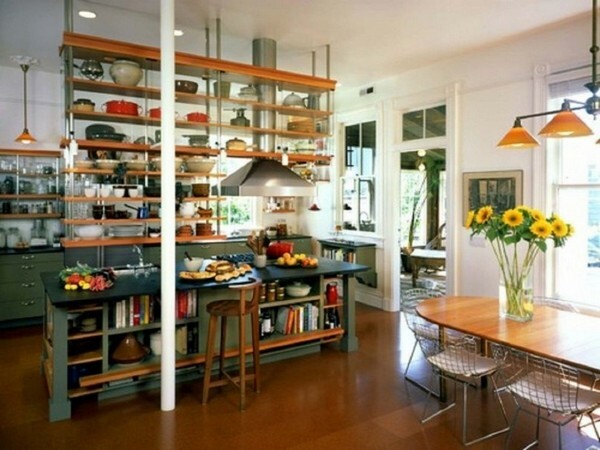 Open shelving in the kitchen can serve two major functions, functionality and decorative purposes. 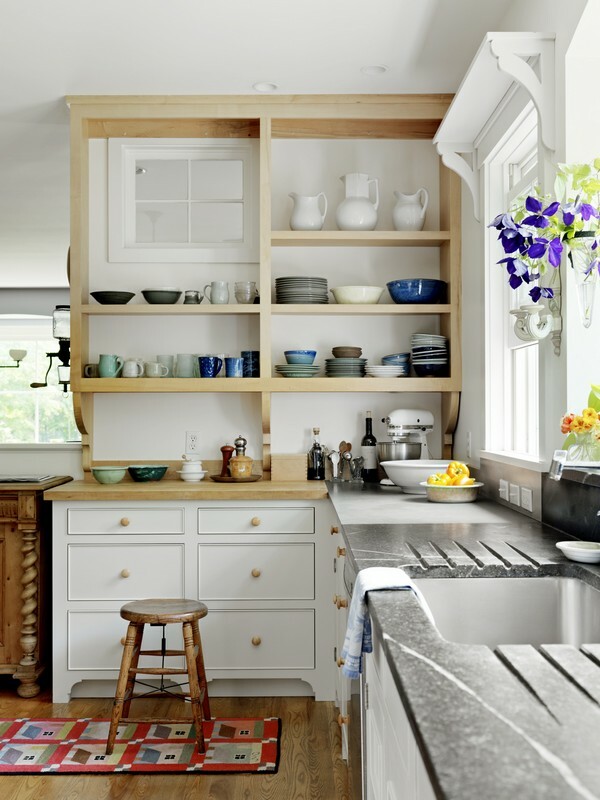 In this kitchen, the open shelves provide functionality. 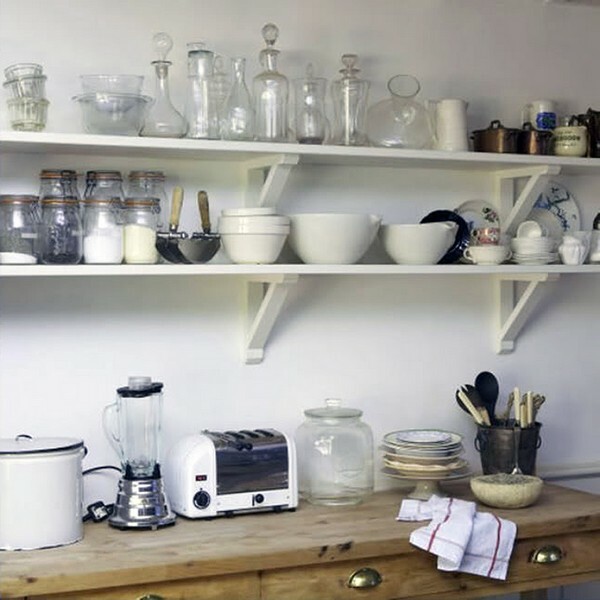 All your cooking ingredients are within arm’s reach this way. 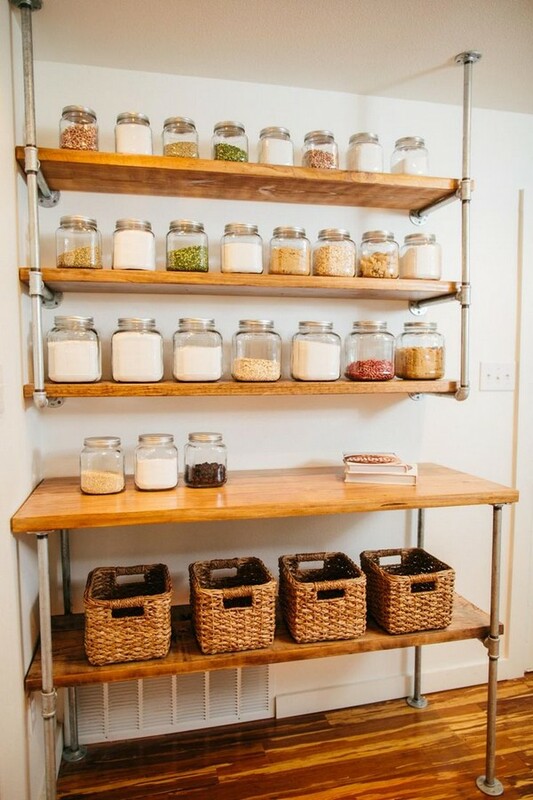 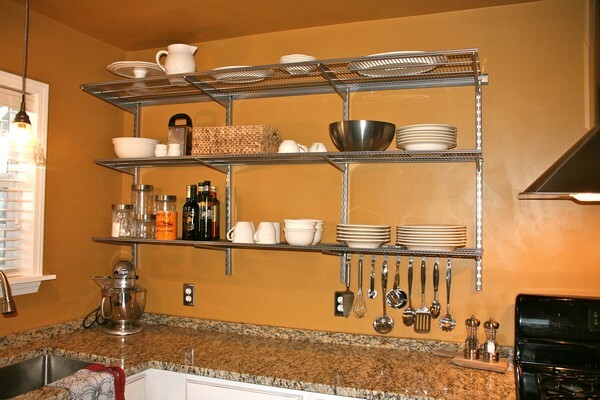 Open shelves also provide an easy way to organize your ingredients and cooking pans. 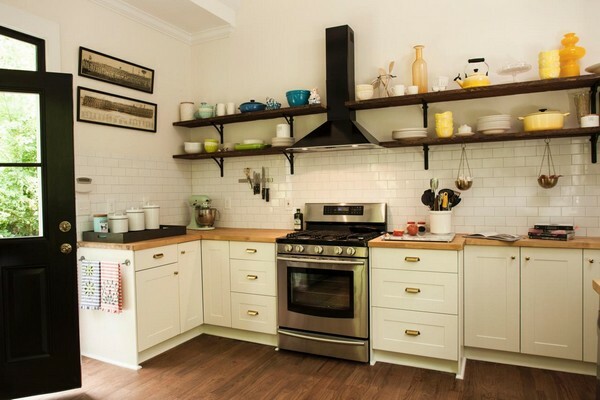 While the open shelving concept works better on a large scale, a small open shelf also looks good, especially if it is a tiny kitchen without much space. 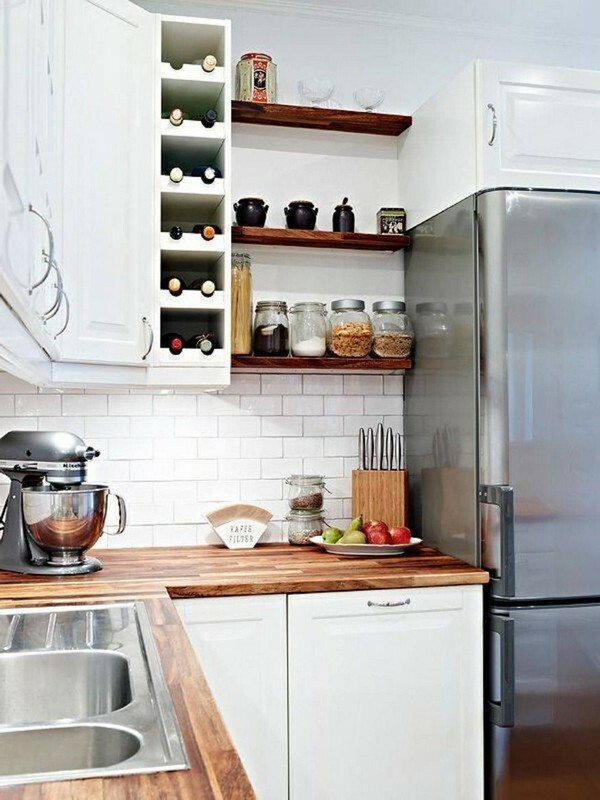 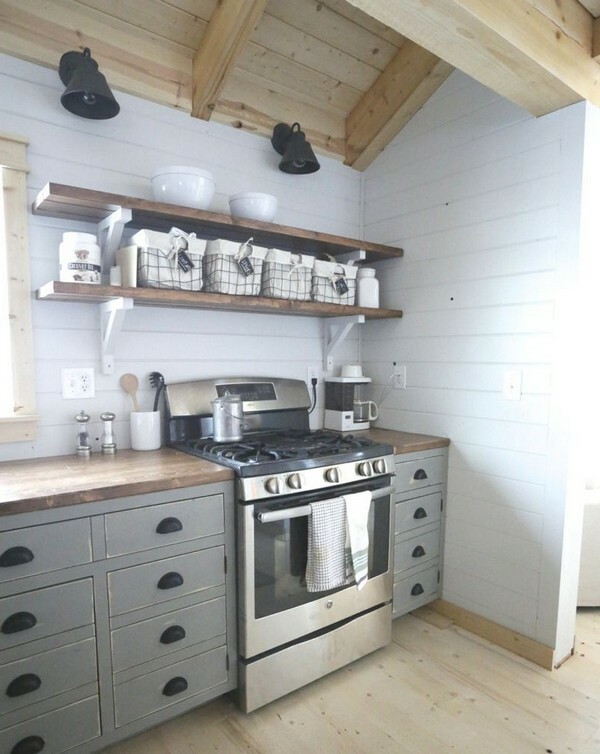 Open shelves work even better in tiny kitchens because it is harder to keep small kitchens organized. 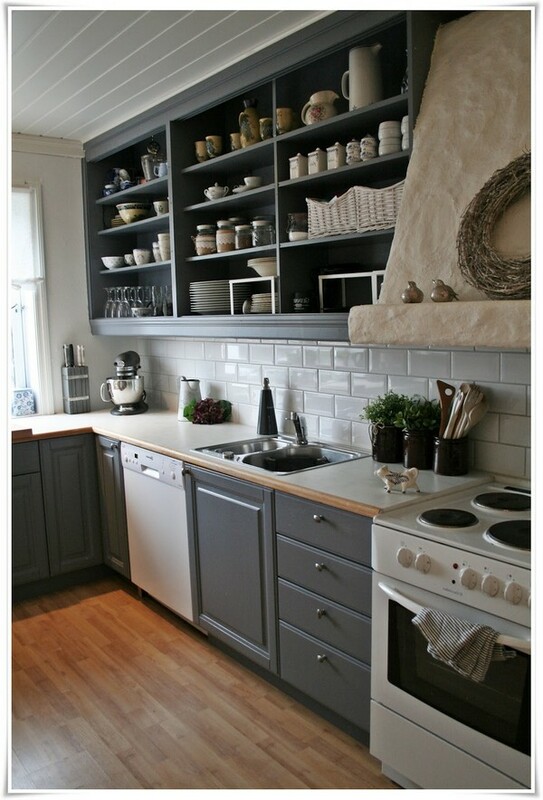 An open shelf, therefore, helps achieve this. 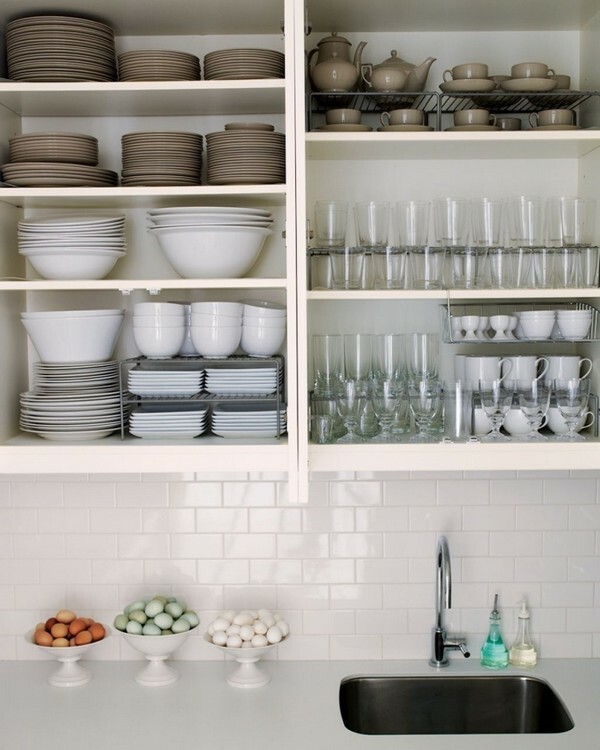 Open shelves can help save space because you can use them to store your dishes. 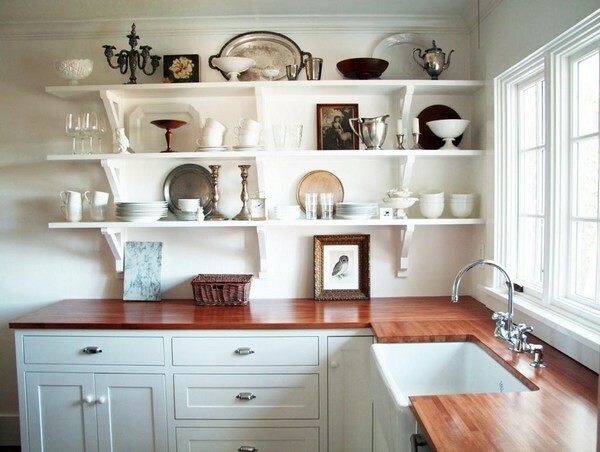 Displaying the dishes on the selves also serves decorative purposes, since they can also serve as décor. 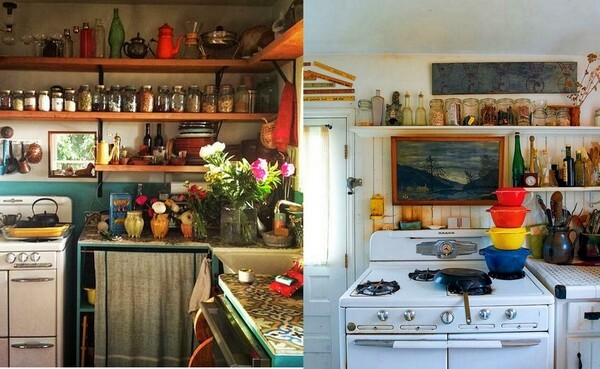 This photo illustrates this concept clearly. 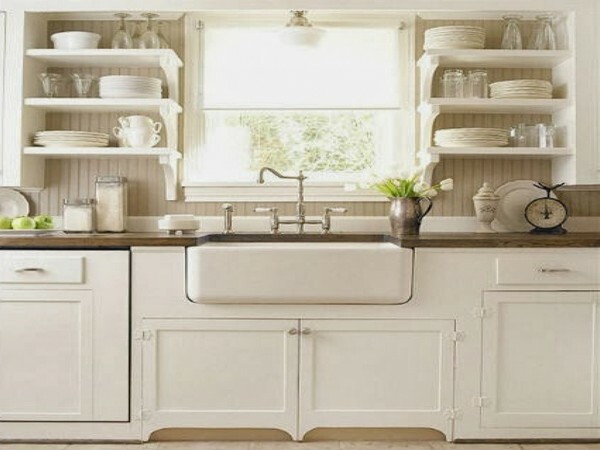 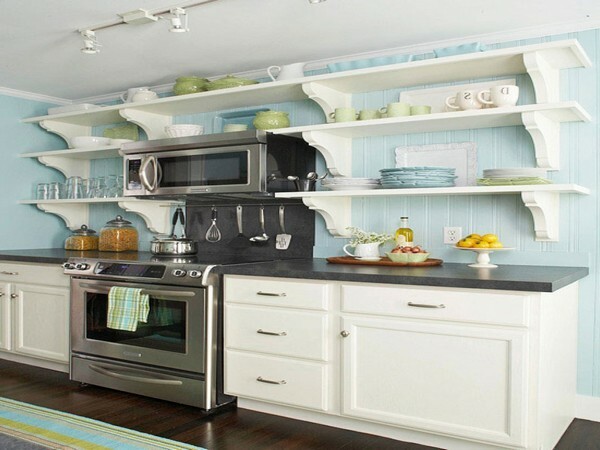 An open shelving design, especially when painted in light colors like white or bold colors like grey help open up the space visually, as seen here. 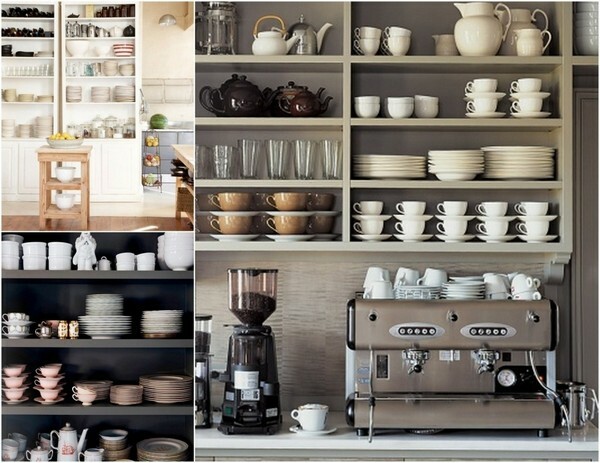 If you want to lean towards a certain design style with your open shelving design, then you have the freedom to do that. 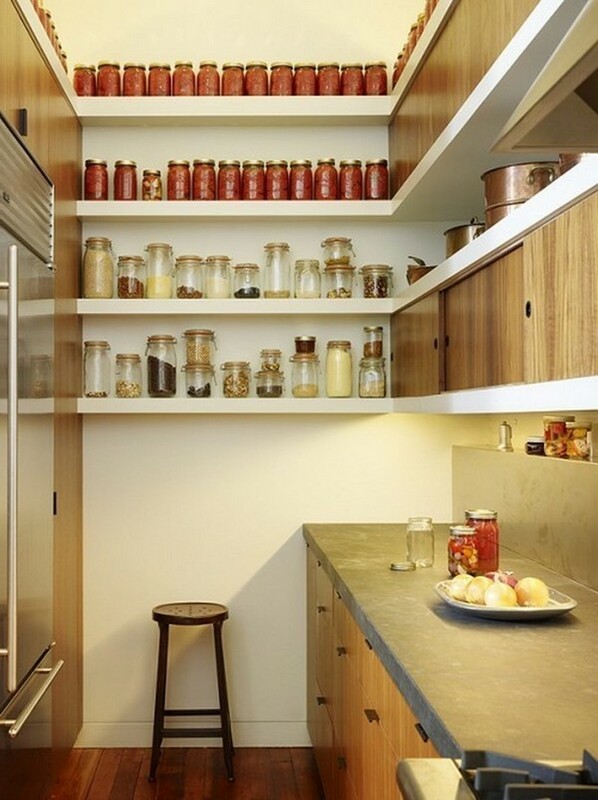 Open shelving designs are all about creativity and there is no limitation to what you can try. 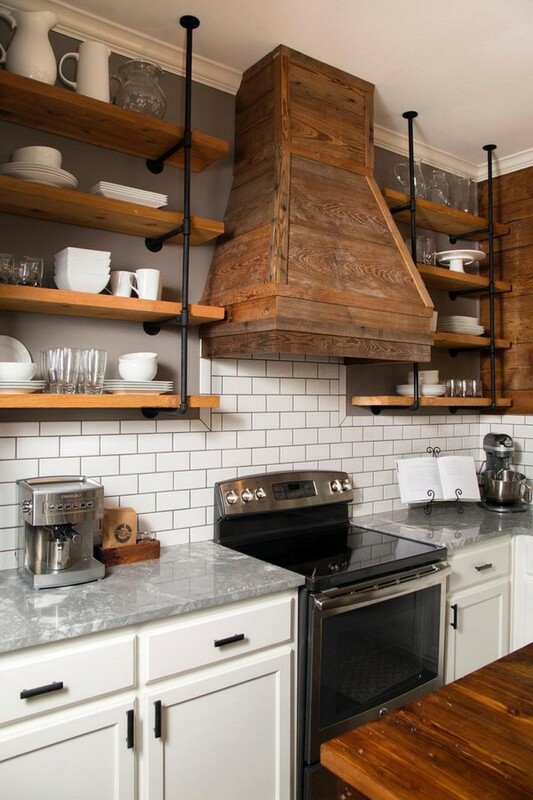 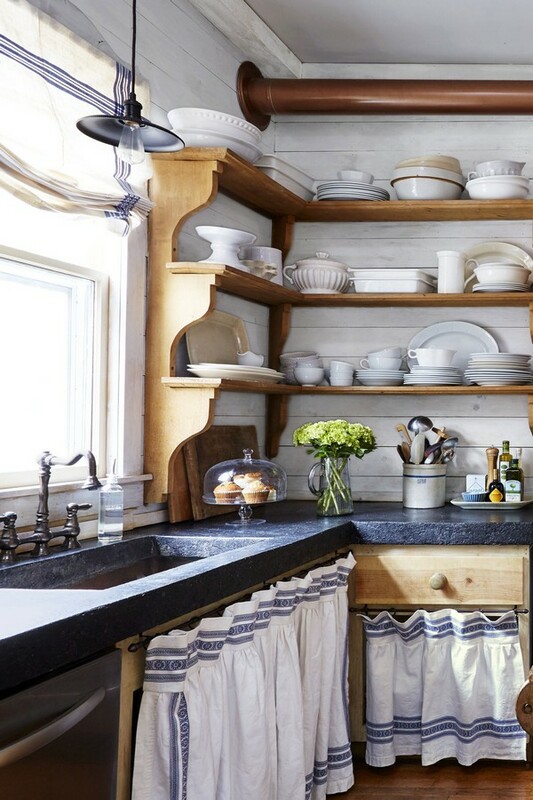 This rustic open shelving design is appealing to the eye because of the side-to-side design, partitioned by the wooden smoke filter, which adds to the rustic concept. 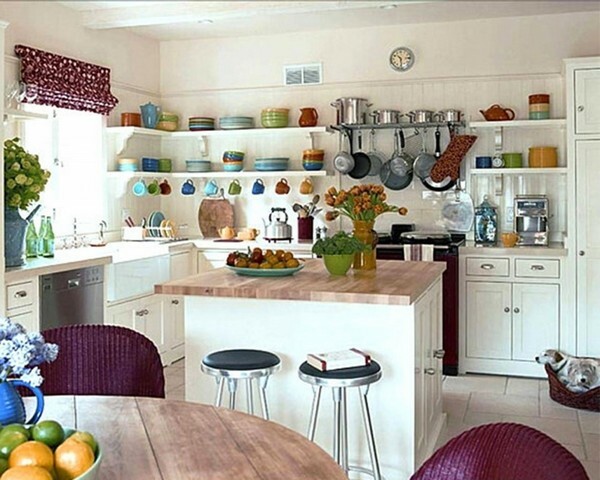 The use of metal and wood to create the shelves, while inducing a rustic charm, also make this kitchen unique and vibrant. 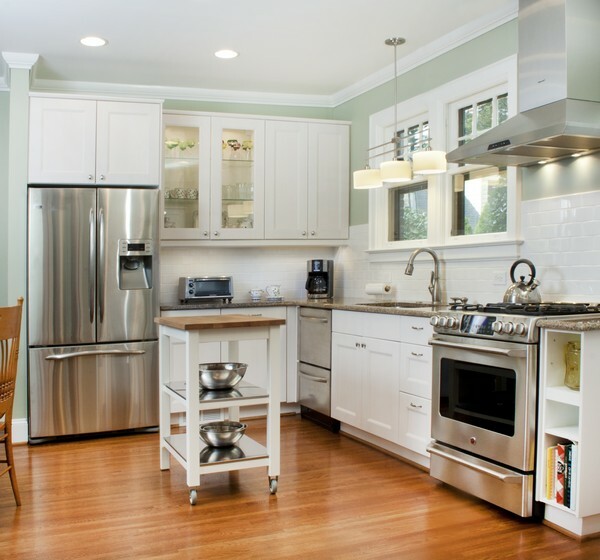 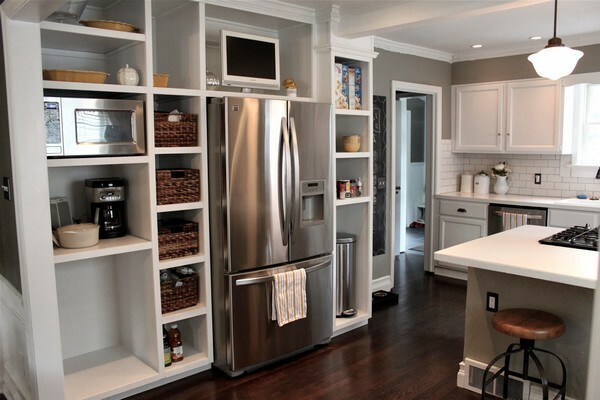 It is important to realize that you are not necessarily restricted to choosing either open shelves or cabinets. 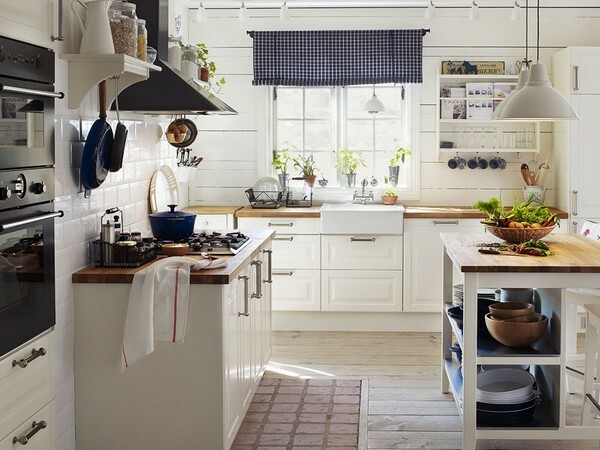 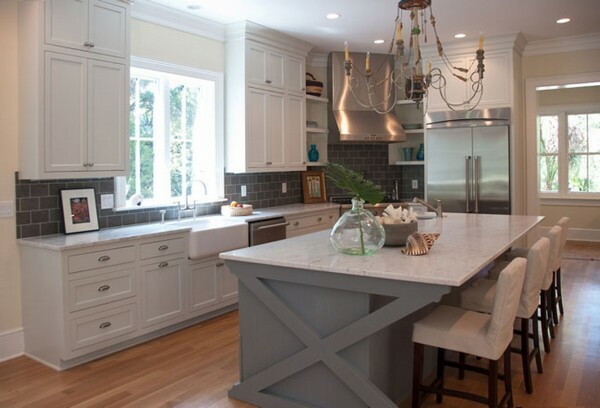 You can infuse both elements to create a perfect design, as seen in this kitchen. 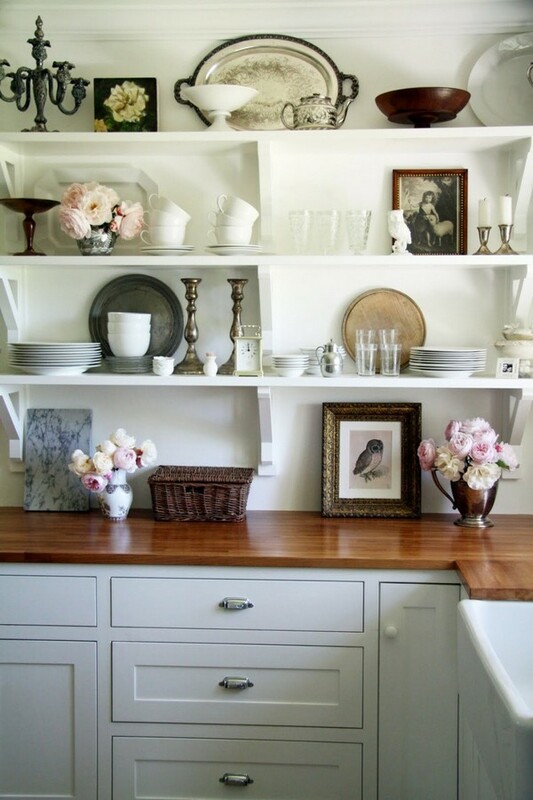 It all comes down to how you position the shelves and cabinets against each other. 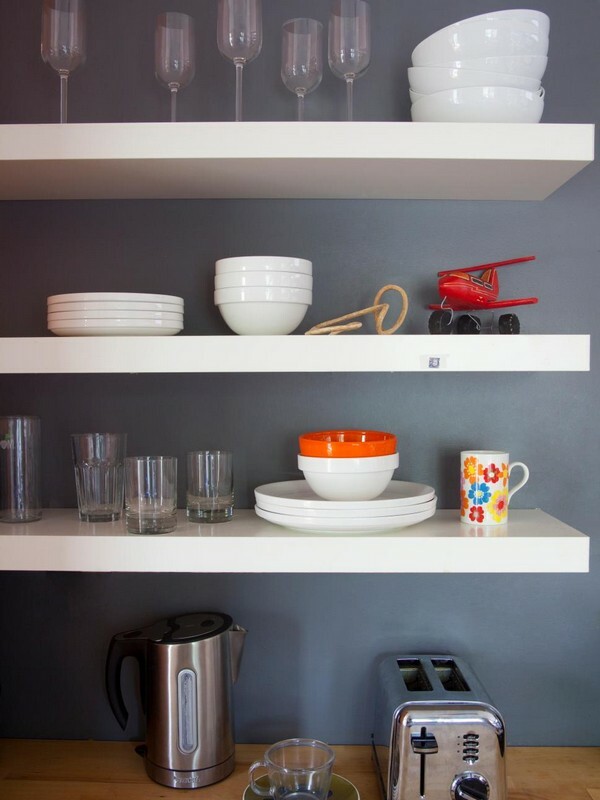 When your open shelf, attention does not just go to the shelf alone but also to the wall on which you will mount the shelf. 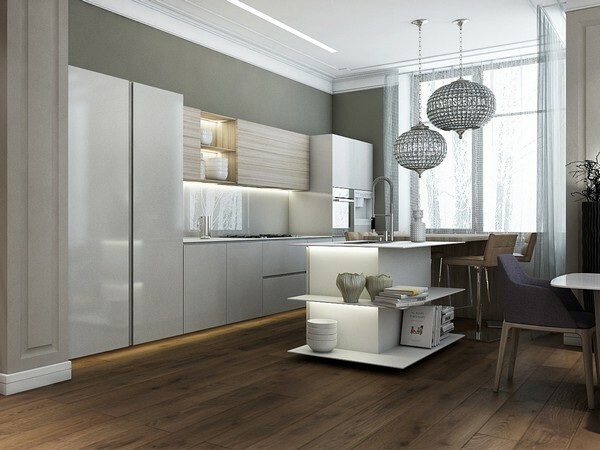 Depending on what you want, you can choose from a range of walls, including concrete walls, wooden walls, tile walls and a whole other range of materials. 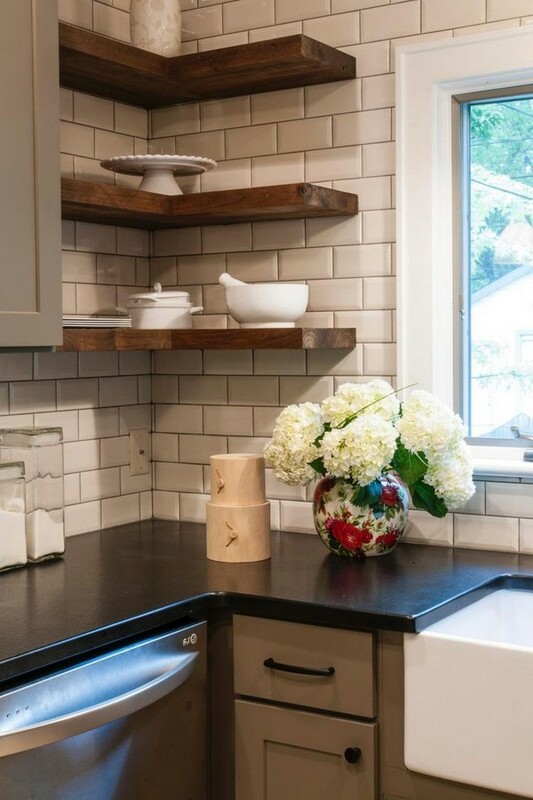 This black shelf here, for instance, contrasts perfectly with the white subway tile wall. 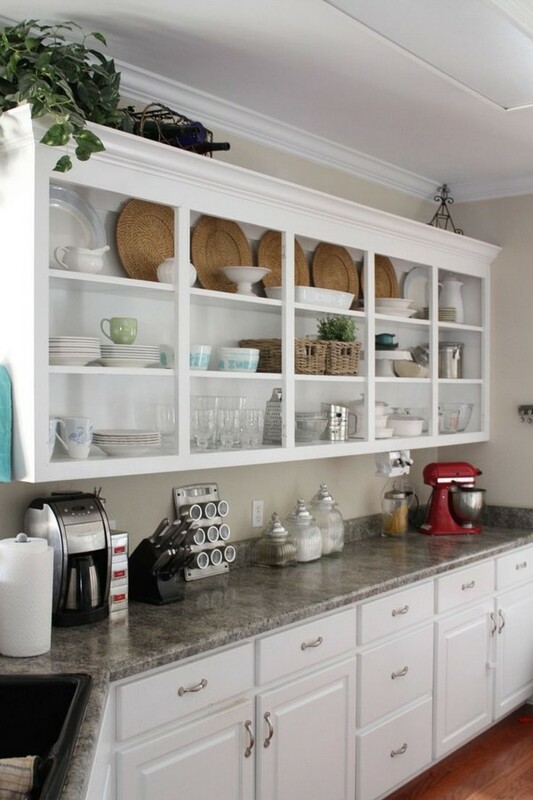 If you want your open shelf to ‘pop’ and get the attention of anyone who walks into the kitchen, then what better way than to give the open shelf a background color that is easily noticeable? 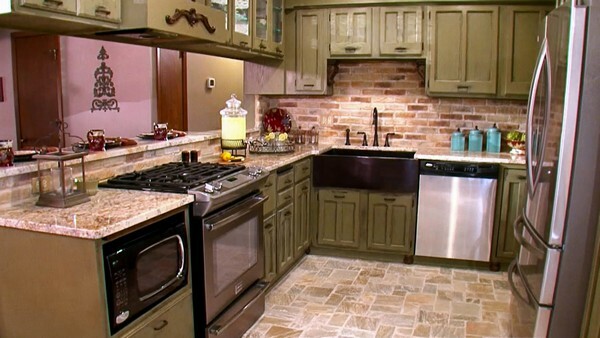 Bright colors such as red, green, yellow and orange work best. 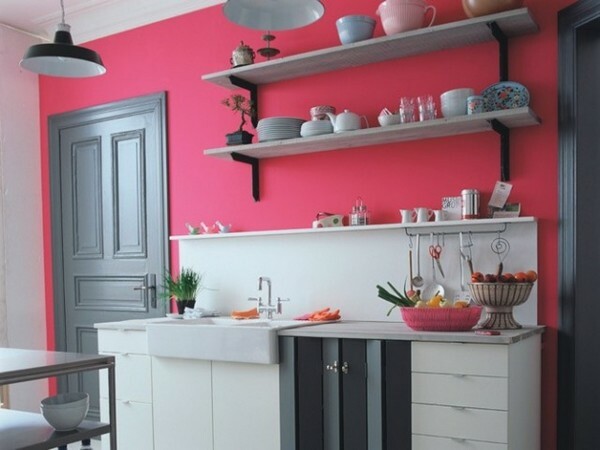 In this kitchen, the background color of the shelf coordinates with other décor in the room, such as the red fruit basket.